The Imperial Amazon is the largest of the Amazons at 45cm (17.5 in), 900g (31.5 oz). 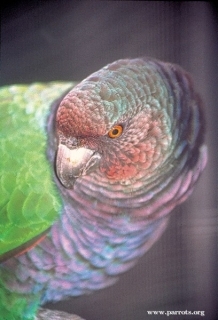 Both adults brown/purple forehead and lores, becoming browner on cheeks to ear coverts; burgundy/maroon crown and neck, washed with green/blue, the feathers edged with black; breast and abdomen dark lilac/purple, the feathers edged dusty black; olive/green lower underparts, feathers tipped green/blue; upperparts dark green, feathers edged black; secondary feathers 1-3 dark burgundy at bases, the remaining secondaries green; red carpal edge; tail red/brown. Bill grey/horn. Eye-ring grey/brown, eye orange/red. As in adult but duller; face dull red/brown; occiput to hindneck green; area behind cheeks tinged with green. Eye brown. Wide variety of calls including whistles, shrieks and squawks. Often loud, but also can be squeaky. Outside flight if possible - 10 x 3 x 2.5m (32.8 x 9.8 x 8.2 ft); inside enclosure 3 x 3 x 2.5m (9.8 x 9.8 x 8.2 ft). Metal construction necessary. Not recorded but assumed to be mainly the same as other Amazon parrots with care not to feed high fat diet: fruit such as: apple, pear, orange, cactus fruit, pomegranate, forming about 30 % of diet; vegetables such as: carrot, celery, green peas and beans; green leaves such as: Swiss chard, kale, dandelion, chickweed; fresh corn; spray millet, small seed mixture (lower fat, limited sunflower); peanuts occasionally; complete kibble. Provide lots of chew and forage items - bird safe wood such as fir, pine, elder or willow, wood block toys vegetable tanned leather toys, heat sterilized pine cones; also enjoys bathing so provide overhead misters or shallow water bowls. Nest box 14" x 14" x 48" (35.5cm x 35.5cm x 122cm). 250-350, however, 2017's double hurricane strike has dealt a severe blow to the population. Around 10 birds have been sighted. Habitat loss and hurricane damage, competition with Amazona arausiaca and owls for nest cavities; some threat still remains from collection for the wild bird trade. Island of Dominica (Lesser Antilles). Occurs in the canopy of primary mountain rainforest; occurs at 600-1300m (1968-4264 ft) but will descend in response to food shortages or foraging preferences. Flowers, fruits, nut and young shoots of many trees. Communal roosts; feeds morning and evening; probably defends nesting territory year round. 2 eggs, 45 x 40mm (1.7 x 1.6 in).